Lubin earned a B.A. in Humanities at the Evergreen State College, an M.A. in American Studies at University of Massachusetts Boston, and a Ph.D. in American Studies at University of Minnesota. 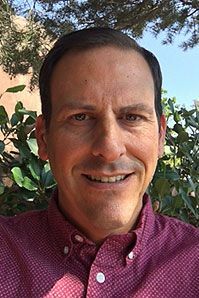 He began his career at UNM in 2002 as an assistant professor in the Department of American Studies. Lubin is currently a full professor of American Studies and has served as department chair for six years. From 2011-2014, Lubin took a leave from UNM while he served as director of the Center for American Studies and Research at the American University of Beirut (AUB) in Beirut, Lebanon. While at AUB, Lubin designed and launched the region’s first M.A. program in Transnational American Studies. Lubin is an interdisciplinary scholar, with expertise in Black Studies and Transnational American Studies, with a focus on U.S./Middle East relationships. He is the author of two single-authored monographs, and the editor or co-editor of three volumes. His most recent books are Geographies of Liberation: The Making of an Afro-Arab Political Imaginary, and the co-edited volume, Futures of Black Radicalism. He is working on a book about the U.S. War on Terror, a topic about which he offers a class at UNM. Lubin serves on the editorial boards of The Middle East Report and The Journal of Civil and Human Rights. He is a member of the American Studies Association’s distinguish speaker’s bureau. Lubin served as interim Associate Provost for Faculty Development during AY 2017-2018. During this year he launched a campus-wide conversation about the Zimmerman Library’s “Three People’s” mural, he redesigned the academic leadership school for new department chairs, and he supervised the university-wide promotion and tenure review process. Lubin collaborated with UNM Advance and with the Division of Equity and Inclusion to center “inclusive excellence” as the guiding value for faculty development. He is currently chairing a task force as part of the university’s redesign effort that is focused on ways to link areas of interdisciplinary strength across UNM colleges and departments. The Associate Provost for Faculty Development has convened the Zimmerman Murals Planning Committee to facilitate a campus and communityy discussion about how to confront the matter of the Adam's 'Three people's" murals in the West Wing of the Zimmerman Library. This committee forms in response to serve decades of student, staff, and faculty protest concerning the murals' representations of New Mexicans. The committee is helping to plan a course, to be offeredin the Spring 2018 semester, which is open to anybody who would like to attend and participate. Several public lectures will be organized and videotaped for public viewing. "UNM's Ombuds/Dispute Resolution Services for Faculty Provides consultation and mediation services to UNM faculry and administrators for flicts. The guiding standard is resolution at the least adversarial level. The long-term vision is a widespread network of trained UNM faculty committed to dialogue, conflict prevention."